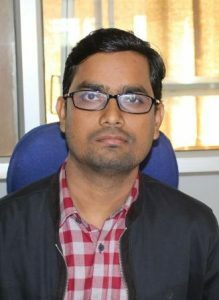 Pramod Kumar Mahish, 2015. Traditional Fish Processing and Economic Status of Fishermen of Central India with Special reference to Rajnandgaon, Chhattisgarh, India. International Research Journal of Biological Sciences, 4(9), 33-42. Pramod Kumar Mahish. 2014. Cellulolytic Potentiality of Some Microorganisms (A case Study of Rajnandgaon Paper Mill Effluent), Research Front, 4 (63-66). Pramod Kumar Mahish, K. L. Tiwari and S. K. Jadhav. 2013. Tolerance of Lead by Some Fungal species Isolated From Industrial Waste Water. DCSI, 9 (2): 229-232. 1. Pramod Kumar Mahish. 2015. Paper title – Infection of Fungal Pathogen on Chrysanthemums (Asteraceae Family) Conference – 18th National conference of Indian. Aerobiological Society® Tumkur University organized by 18th National conference of Indian. Aerobiological Society® Tumkur University, Karnataka from 28-30 September 2015. 2. Pramod Kumar Mahish, 2015, Cyber Crime and IT Challenges in Biotechnology. Conference title – “Cyber Crime and Challenges” Organized by Dept. of Sociology, govt. Digvijay PG college Rajnandgaon from 6-7 February 2015. 3. Tiwari K. L., Jadhav S. K. and Mahish Pramod Kumar, 2013. Tolerance of Heavy Metals by Cunninghamella elegans TUFC 20022 isolated from industrial waste water of Raipur city, Chhattisgarh, India. Conference Title- “Traditional Knowledge and Biotechnology” Organized by – School of Studies in Biotechnology, Pt. Ravishankar Shukla University Raipur (C. G.) from 22-24 November 2013. 4. Pramod Kumar Mahish, K. L. Tiwari and S. K. Jadhav. 2012. Some rare and uncommon fungi isolates from environment of Chhattisgarh in National conference on Conservation of Biodiversity in India, Some Issues at Arts and commerce girls college, Devendra Nagar Raipur from October 16 to 17 2012. 1. Participated as Resource Person in “State level training workshop of district coordinators” under Children Science Congress 2013 on the focal theme of Energy: “Explore, Harness and Conserve” organized by Chhattisgarh Council of Science and Technology Raipur at J. N. Pandey School Raipur on 02nd July 2013. 2. National Workshop on “Scientific/Research Paper writing” organized by The National Academy of Sciences, India (NASI) from June 08-10, 2012 at Central Institute of Fisheries Education-CIFE, Mumbai (M.H.). 3. Workshop on “Prospection and Sustainable Use of Medicinal Plants of Chhattisgarh” organized under the auspices of National Center for Natural Resources (NCNR) at Pt. Ravishankar Shukla University Raipur (C.G.) from September 10-11, 2012.